Hello everyone, I just wanted to make a little render with the zdepth assembled 🙂 I used Nuke to comp it, it seems like it was the only software that worked with my Zdepth pass. Ah well! 😛 Enjoy! I just posted a new drawing on my Deviant Art page. It will be the main reference for a maya scene that I will create, and which will be part of my portfolio! I started working on the animation of this pocket watch. I’ve been trying to combine rigid bodies in Maya with joints in the chain, and the fact that I’m using a Spline IK on this part makes it complicated for me (due to my lack of knowledge on the subject) to animate it naturally. For now the chain links don’t look natural at all and are well spaced with eachothers. I want contact! 😛 Any ideas or suggestions on how to make dynamics with a spline IK? Oooohhh my god I just discovered this website (for which I will nicely do free promotion): simplymaya. They have awesome tutorials for beginner to intermediate level users of Maya, and I should say, it’s really really useful! For a good price, you can get multiple-hours tutorials on different subjects. I bought one on lighting, materials and renders, and here are the results! It’s very impressive. I do not take the credit for the textures as they were all given to me with the tutorial, but we have to say the result is quite convincing. I will definitely use the same scene for new materials and new lighting soon. It was the first paid tutorial I ever tried (as the other tutorials I did were all free), and I am quite convinced. Here it is! 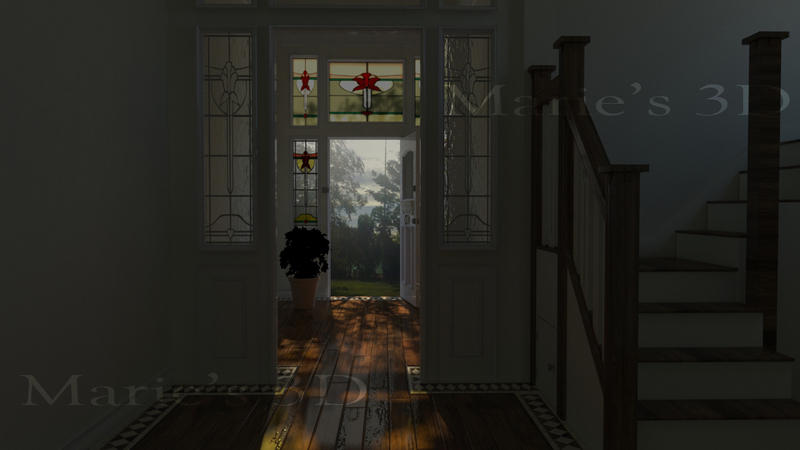 This is the same scene that was used for the night render, only this time, I had to rearange the lights and the render settings (plus a few materials) so it would make a convincing daylight (actually it looks more like morning in there). This exercise was my first real attempt at making photorealistic renders. I hope you like it!